Easy Chicken Curry Recipe - Healthy and simple to make! You are here: Home / Recipes / Easy Chicken Curry Recipe – Healthy and simple to make! 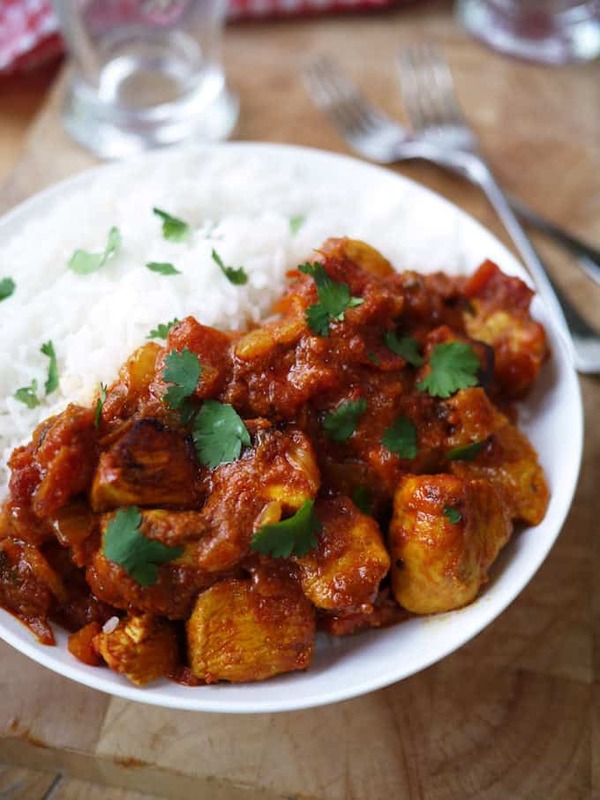 You need this Easy Chicken Curry Recipe in your life! This healthy curry recipe is low calorie, fresh and super tasty. This delicious low fat Chicken Tikka Masala is medium spiced. Simple to make, freezes well and all of the family will love it. It’s been weeks of over indulgence and ALL THE CAKE here. I’ve loved every moment but now I am well and truly back on the wagon to eat healthily again. One of my favourite ways of sticking to healthier options is to create versions of my favourite foods that are just a little lighter. This Easy Chicken Curry recipe is one of those. A while ago Tefal sent me their new Tefal ActiFry XL Express machine to try out. Spoiler alert, it was amazing. I tried this Chicken Tikka Masala recipe in it and it was genuinely better than a takeaway. The beast of a machine will knock out chips for 6 in 30% less time that the other ActiFry machines. It is not a small piece of kit, but if you’re trying to cut down on the fat you eat, I have to say, it works it’s socks off in this kitchen. This recipe makes the most of that searing hot air that the ActiFry cooks in to give the meat that slightly charred edge that all of the best Chicken Tikka has. I have never quite managed this at home before, but cooked in this machine is was a cinch. 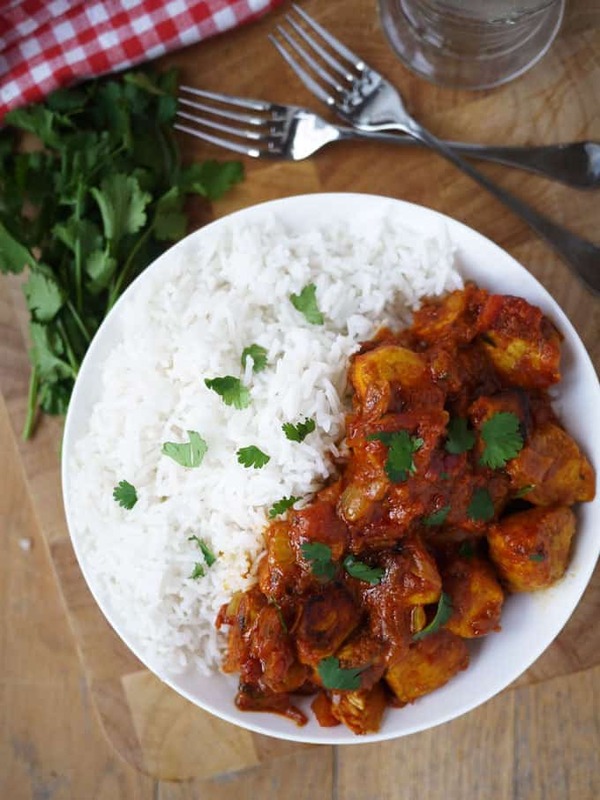 It’s absolutely fine to cook this Easy Chicken Curry recipe in a saucepan as normal, but I just thought I’d share how good it is in the Actifry in case you have one and fancy trying something a little different. Don’t worry if you don’t have time to marinade the chicken, but if you do? It makes a big difference and really improves the flavour. You can mix and match and try different curry pastes if you prefer. This basic method works well for lots of different flavours like Jalfrezi, or Rogan Josh. What vegetables can you add to this Easy Chicken Curry recipe? I often add spinach, chickpeas, mushrooms or cauliflower. All of these work really well and make this a more complete meal. 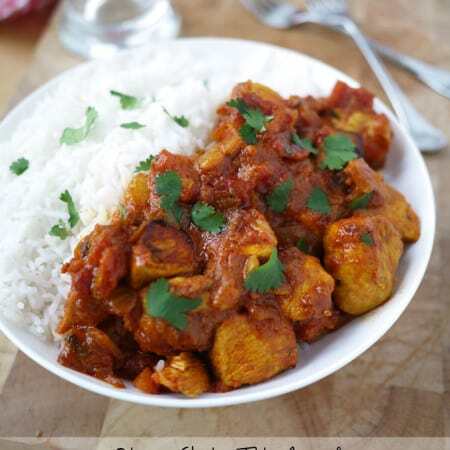 Looking for other family friendly easy curries? How about my favourite Lamb Keema Curry recipe? Hope you enjoy this recipe as much as we do. I’d love to know how you got on and what you thought of it if you make this Easy Chicken Curry recipe. Please rate the recipe and leave me a comment below if you do. 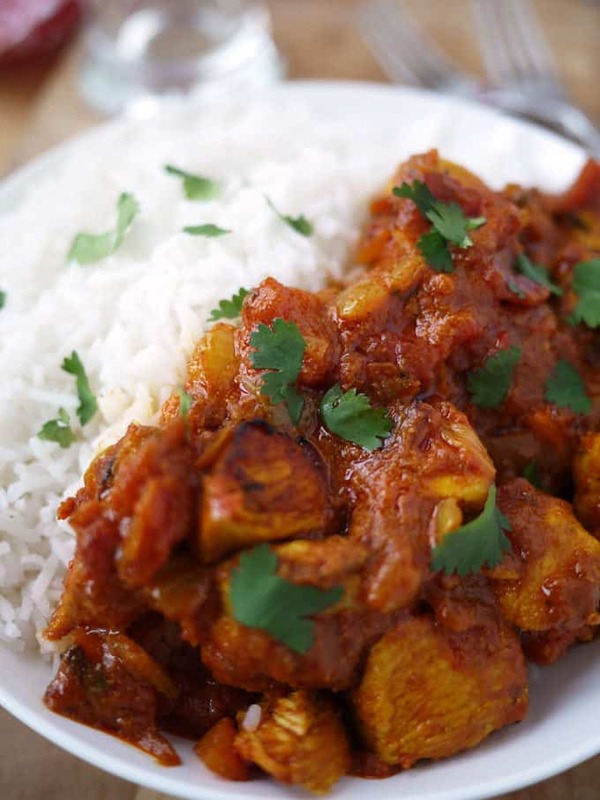 A delicious low fat Chicken Tikka Masala recipe, the healthy curry recipe you need in your life. Low calorie, fresh and super tasty. In a large bowl mix the chicken, curry paste and half of the yoghurt. Cover and leave in the fridge to marinade over night or for at least 2 hours. Heat the oil in your saucepan over a medium heat (or ActiFry) for 2 minutes, add the onion and cook for 5 minutes. Add the remaining half of the yoghurt, sugar and lemon juice. Stir well and cook for another 5 minutes. Oh my goodness this recipe looks AMAZING and the ActiFry sounds intriguing too – I like the idea of cooking with hot air. Yum! I am really impressed by the number of things that you can make in an Actifry, when they first came out I thought they would be a fad, but they really have stood the test of time. Lovey photos of a difficult subject too. I actually made this in my Actifry the other day too. It was delicious. I seriously love that machine. What a fab picture and recipe. I want to dig right in. This looks delicious Sarah, nothing like curry from scratch. 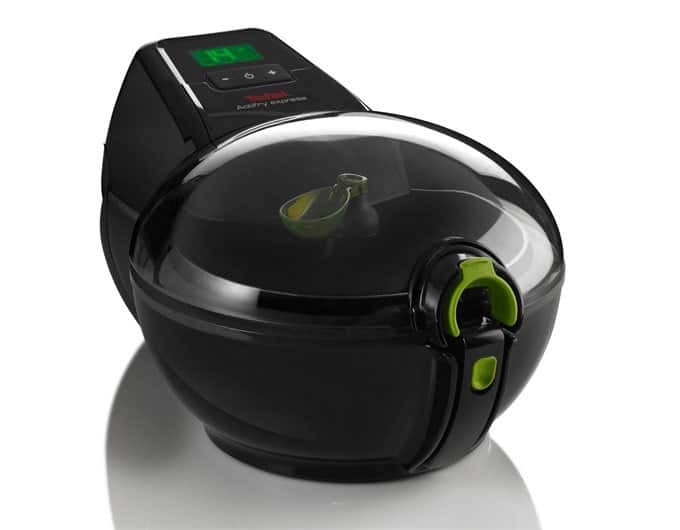 The Actifry looks intriguing too. Did I meet you at a Pinterest event with Tom Aiken? Is it just my imagination? You just look very familiar. That was a great night ! This looks seriously tempting. Interested that it heats so high to seal the meat. Sarah, I love Chicken Tikka Masala and think my own recipe is great, but this one looks really good, too. I see so many recipes that just don’t sound “right” and the photos don’t look appealing. This CTM looks good! Can this be made in a regular actifry? What about the turning arm thing? Sorry if I am being a bit slow ! This recipe doesn’t make any sense, it says to add the yogurt with the chicken however later on it says to add both the chicken and the yogurt separately, so which is it? Hi Hannah, so sorry! I’ve amended it now. You have eagle eyes, this is an old post an no one has ever pointed that out! Thank you. Yes, or sometimes you can take the paddle out it it’s things that would break up easily when being moved. Hope that helps!